Remarkable invitation to wonder, this album is an ode to the magnificence of the Forest, celebrated for centuries for its beauty and wellness regenerating. 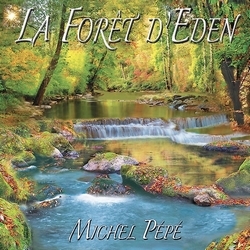 Michel Pépé takes us here in this wonderful paradise of biodiversity to meet the fauna and flora, to give us an idyllic and luminous work, full of serenity and harmony. Enter majestically in the Forest of Eden, where we hear the heart beat of our planet in order to reconcile and unite man and nature. We are pleased to make you discover it on Radio PLENITUDE, every day, from october 07 until november 03, before it enters in a regular programming. Thank you very much to Michel Pépé for his dedication to our attention, this delicate intention made us very flattering.